This post is from author Orly Konig. She often posts great photos of her cats on Instagram, so if you enjoy this post, make sure to follow her on IG! When I started working from home several years ago, I pulled rank and went to adopt a cat. A as in one cat. My husband was not a fan of the idea but agreed to one small cat — after all, how much of a footprint does ONE cat take? Surprise! Walking through the shelter, I felt a tap on my shoulder. When I turned to see who wanted my attention, a large kitty reached up for me to pick him up. And while he was hugging me, his equally large brother wrapped himself around my foot. That was it, I was officially theirs. These two are my constant shadows. Where I am, they have to be. Which is one reason I find myself working on the kitchen table more than in my office (well, space for the cats and it’s closer to the espresso machine). I’ve found countless typos that I fully blame on cat paws. 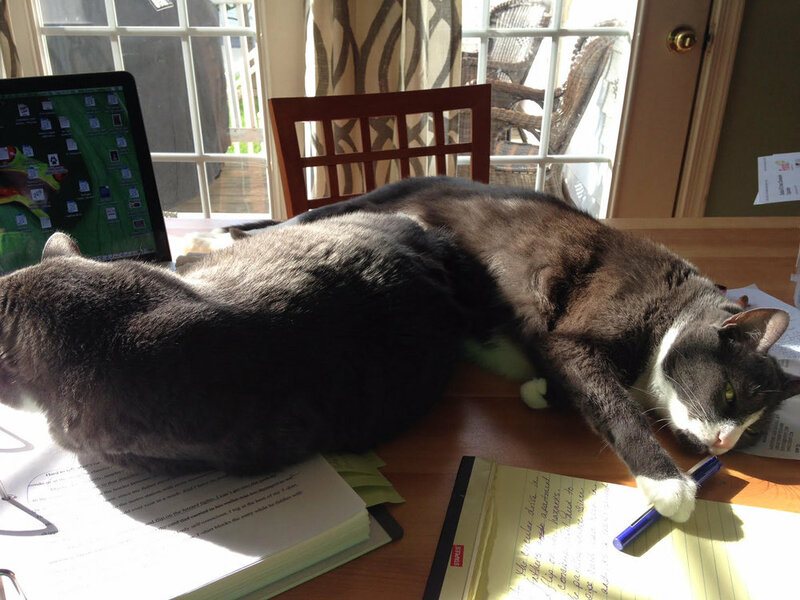 Sticky notes that stuck to cat bellies inside of manuscript pages. Sterling has a tendency to shred pages if I’m spending more time writing than petting him. And Spencer has been found guilty of drinking from my lattes when I’m not paying attention. I wouldn’t have it any other way (well, except for sharing the coffee!). Not one, but TWO cats. You can find The Distance Home on Amazon, Barnes & Noble and at other fine booksellers! Orly's second novel, Carousel Beach, will be out on May 8, 2018. You can pre-order now on Amazon!